Viljo Revell, the architect of City Hall, did not live to see the opening of this impressive and uniquely designed building. His legacy, however, remains a major architectural accomplishment. Revell’s design was viewed by many as representing a break with tradition. Former Mayor Phil Givens claimed that “new City Hall has provided staid old Toronto with the impetus and architectural inspiration with which to proceed.…” Indeed, despite the considerable controversy and debate among architectural traditionalists, this award-winning design represented a step forward in time and was repeatedly described as ‘monumental’ and ‘expressionistically modern. September 13, 2005 marks the 40th anniversary of the opening of City Hall. 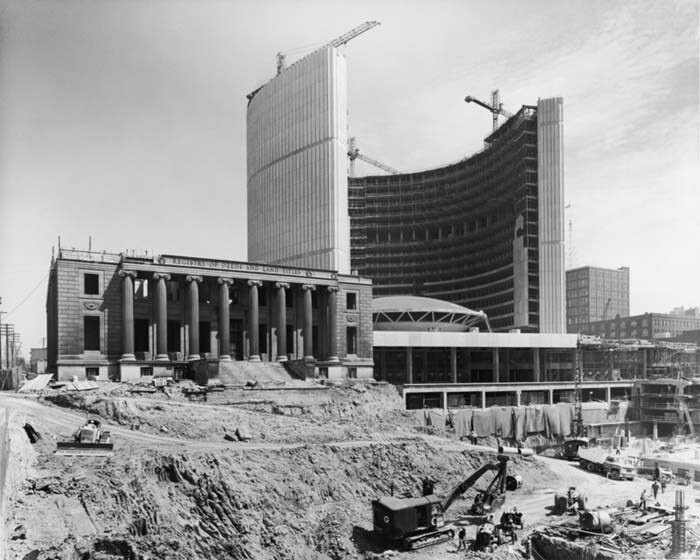 To commemorate the anniversary, the City of Toronto Archives has mounted this exhibit to provide a brief architectural history of the events leading up to and including the opening of City Hall. The information in this display was drawn from a larger exhibition entitled Meeting Places: Toronto’s City Halls, which was co-curated by Professor Douglas Richardson and Stephen Otto for the Market Gallery in 1985. The historical materials shown were selected from the holdings of the City of Toronto Archives. Original negatives by Panda Associates are housed at the Canadian Architectural Archives at the University of Calgary, who gave their kind permission for the photographs to be reproduced and displayed here. In 1955 City Council decided to ask the electorate to approve spending $18,000,000 on this proposal for a new city hall drafted by a consortium. The three firms (Marani & Morris, Mathers & Haldenby, Shore & Moffat) were noted for substantial institutional buildings of refined materials but conservative form. Their design called for two formal tree-lined public squares above an underground parking structure—one square with reflecting pools for the old Registry Office, a larger one without for the proposed City Hall. For the Hall itself they would have put a tall office slab across the back of the site, but reduced its impact through a U-shaped structure of three storeys in front. 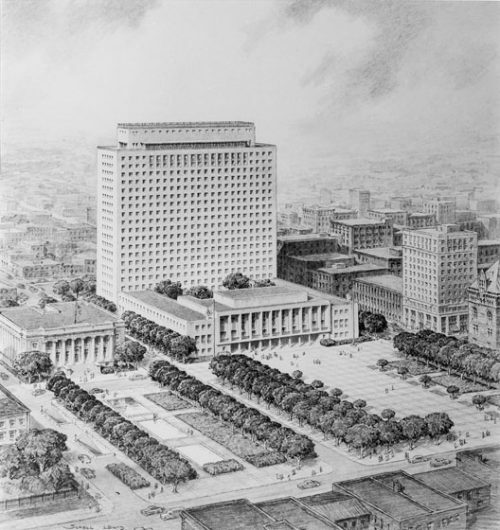 The low building would house public-access areas, aldermanic offices and committee rooms, with the Council Chamber in the middle (behind a shallow balcony for ‘certain public functions’); it would also enclose a courtyard through open colonnades on three sides as shown in these original renderings by a leading American delineator, Schell Lewis. When the City Hall project was published in the autumn of 1955, architectural students at the University of Toronto denounced it as ‘dull and uninteresting and indistinguishable from…insurance buildings’ by these firms, an ‘inhuman pile of stones,’ ‘a funeral home of vast dimensions,’ comparable to Russian institutional architecture. Coverage in the student newspaper, The Varsity, was picked up by Toronto dailies and undoubtedly influenced the plebiscite in which the proposal was defeated. This final outburst on voting day described the need for detailed requirements, the ideal city hall, and the desirability of an international competition following careful guidelines.